I question the choice of this answer as “high quality”. At least four of the seven comments on it are critical. I posted a comment, withdrew it, and said “No Action Needed”. I didn’t downvote it or flag it. The audit failure message says, “… you should have considered leaving it as-is …”. Well, that’s what I did! Why did I get an audit failure for that? Your logic is circular. If you admit the possibility that the malware is so sophisticated that it might recognize an ISO file for an operating system and infect the ISO, then you should also admit the possibility that the malware will have corrupted any checksum/hash software on the infected box to recognize the infected ISO file and report back the checksum of the original, untainted image. If you mean “burn the CD on your machine but go to a friend’s machine to check the hash”, you should say so. … which adds little to what Zoredache already said. It happened again. I got a First Posts audit (and again, I would debate the claim that this was a high quality post – it was just absurdly popular). I posted a comment and then clicked on “No Action Necessary”, and I failed the audit. In case I’m being misunderstood (which seems to happen a lot), let me emphasize: while I’m unhappy about the way the system takes highly popular posts and assumes that they must be high-quality, that’s not the thrust of my complaint. I’m complaining about the fact that, if I post a comment and then click on “No Action Necessary”, I fail the audit, even though the message says, “you should have considered leaving [this post] as-is”. Second update: Good news: If you leave a comment and then upvote, you pass the audit. P.S. “STOP! Look and Listen.” ??? I don't hear anything. I think there needs to be another type of review, one that reviews the posts chosen for audits. Seems like this type of situation happens often enough where people trying to review are getting failures on faulty logic. 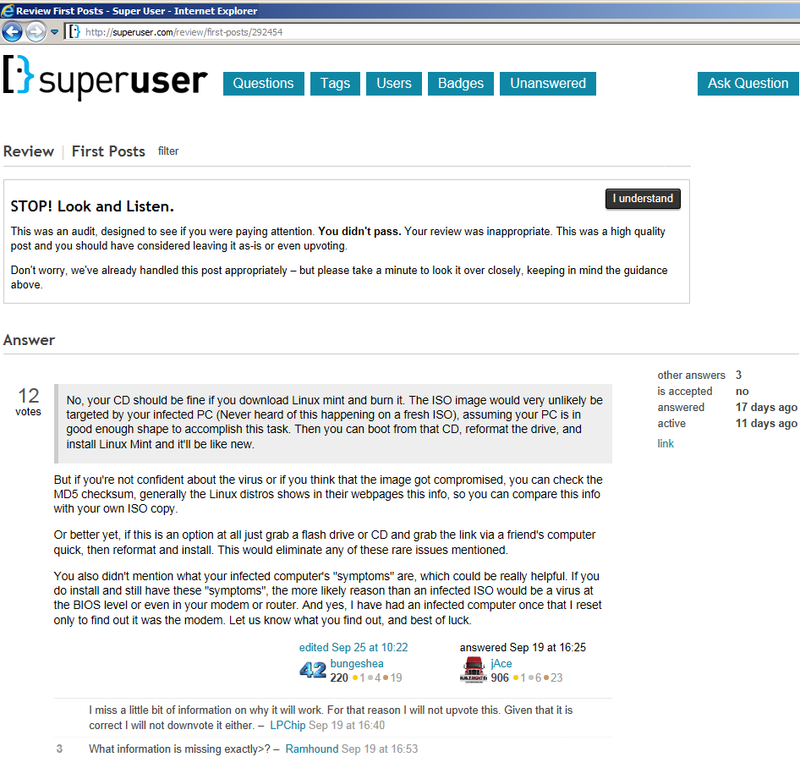 My experience was this https://superuser.com/review/first-posts/336393 I had tried to post a comment on the answer to ask the user to include references from the manufacture and other supporting documentation to improve the quality of the post but I should have left it alone because it was "high quality"
We already understand that we suffer from Too many upvotes for poor quality answers as well as other issues far too often. To leave the audits as purely random seems to invite more false indicators and could discourage users from participating in the community (I for one will be leaving the review queue alone for awhile). Seems like a simple, helpful change to add an audit review feature. As to implementation, I would say it should happen much like the audits currently do. Randomly while someone is in whatever queue they would get a page saying "Help us improve our audit process! Does this post fit the criteria to be a good test for X?" Where "X" would state the desired outcome of the audit. Let the user say yea or nay and of course never give them what they vote on as their own audit. Not the answer you're looking for? Browse other questions tagged bug review-audits .